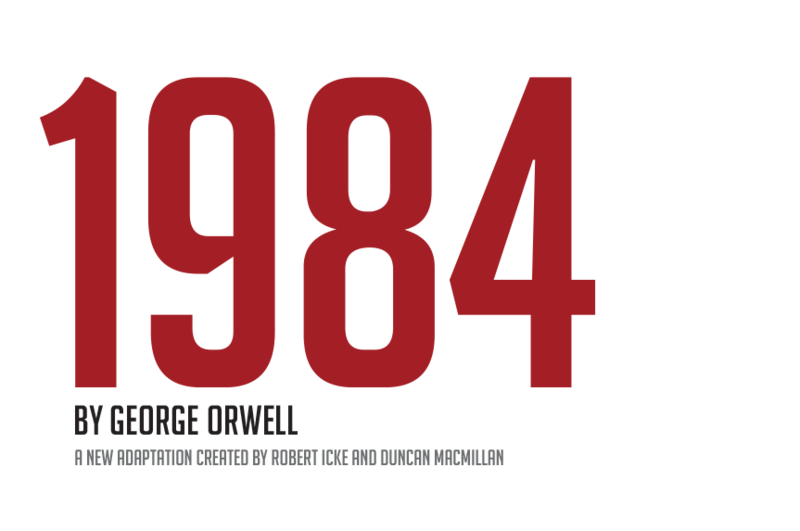 1984: OBJECTIVE TRUTH AND FACTS AND WHO CONTROLS THAT TRUTH. Adapted for the stage by British creatives Robert Icke and Duncan MacMillan, the Olivier Award nominated production will be opening on Broadway in June. In the meantime, we will be lucky enough to catch the show as it tours around Australia from May 13. Read on as Australian director, Corey MacMahon, discusses personal politics; Orwell and his themes; the work of Icke and MacMillan; and much more. I generally veer towards creating theatre that speaks to my politics, to how I would like to see the world, or that will shine a (sometimes uncomfortable) light on where I think we’re going wrong. From my perspective, things are rapidly moving in a less compassionate, less humane and less just direction. People in positions of power and privilege are increasingly taking advantage of those “at the bottom of the pile” (to quote Winston from the play). It feels as if this time of enlightenment, of progressive, liberal thinking, is coming to an end. Any hope of a truly egalitarian society, one that embraces diversity and creates wealth and opportunity for everyone seems to have passed. So this adaptation of 1984 is timely, to say the least. In fact I’d say there is now sense of urgency to the production hitting our stages. The world created on stage in this adaptation of 1984 isn’t some kind of dystopian future with a population crushed by a brutal totalitarian regime. It’s very reminiscent of our own. And that I think is one of the (many) exciting choices the creators made when they were building the show. By setting this adaptation of 1984 not in a post-apocolyptic world but one similar to our own, the play places the audience uncomfortably close to Winston Smith’s fight for truth and freedom. The propaganda pumped through the ever-present telescreens, the nationalistic fervour surrounding the never ending war between Oceania and Eastasia (or Eurasia depending on what day of the week it is) and the ruling Party’s control of thought through the destruction of language are all closely aligned to the encroachment by governments on our personal freedom and privacy and to the way those in positions of power manipulate what is true and factual to suit their own political ends. We, like the people of Oceania, seem to live in a perpetual state of war and just who the ‘enemy’ is that we’re fighting seems to always be changing. I would say however, that the adaptation is faithful to the book. Robert Icke and Duncan Macmillan haven’t set out to create a play that is didactic in anyway. It’s an audacious and thrilling adaptation of the Orwell novel that just happens to once again be frighteningly relevant. In our staging of the adaptation, we let the work speak for itself and not try to twist its focus so as to speak directly to world events. That’s there already. Robert and Duncan wanted to create an adaptation that was as thrilling as a feature film or new series on HBO. So this is not museum theatre. It’s been created for a generation of media and theatre audiences who want a thrilling, challenging, exciting theatrical experience that is just as good, if not better, than going to the cinema or watching the latest HBO series. It’s use of audio visual technology as an integral part of the storytelling takes the story in a unique and unexpected direction (you’ll have to buy a ticket to find out what that is!). And of course, there’s that thing in theatre you just can’t replicate in the cinema or on a tv screen. A three-dimensional world created in front of you. And the show is so dynamic, it will sometimes feel like we’ve reached out into the auditorium and given you a quick shake! My experience of reading Orwell is limited. Because of the place 1984 holds in a collective subconscious, I am one of those people who thought they’d read 1984, but realised I hadn’t. Being offered this production introduced me to his writing and to the man himself. So I won’t offer any half-baked insights into his writing per se but what I would say is that his politics, his ability to foresee events playing out in the future has certainly been an aspect of his writing that has meant his work lives on the way that it does. The adaptation is just so clever. It takes the often unread appendix at the back of the book and uses it as a framing device through which we enter the world of Oceania and the story of Winston Smith. It’s completely unafraid to take the audience to some very expected places. The adaptation focuses on what is objective truth and facts and who controls that truth. Sound familiar? I can’t be pinned down to a favourite part of the story. The adaptation is just so exciting. So I am loathe to favour one aspect over another. If you want to see an intelligent, very contemporary adaptation of one of the Twentieth Century’s most important literary works, one that will not only make you see the current world in a very different light but a stage adaptation that will change how you see theatre then I reckon this one is for you. I am biased, of course, but it’s no accident the production has been seen by almost half a million people world-wide and is opening not only here but on Broadway. It’s a very unique production. Incredibly powerful but also just a bloody good night in the theatre.